Admit it. You suspected our whole week of blog posts would have an equine theme! 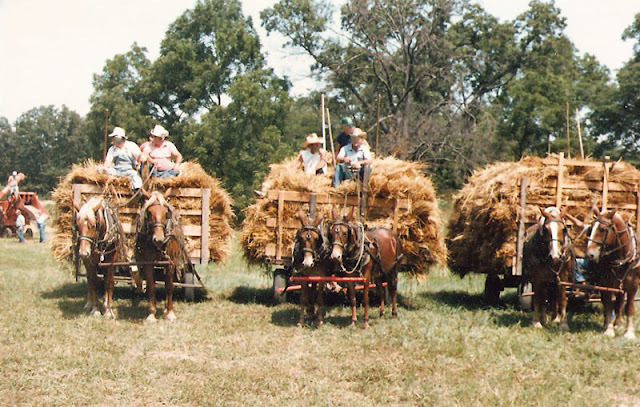 Yes, it is a modern day threshing. For you city slickers, that's all about oats. I have a farm story to tell. Tomorrow. I've heard that song all my life but I've never seen a sheave before. Thanks for the photo. looks fun but it also looks HOT! I guess this is the blog to go to right now for horsing around??? Such a great photo! I love it! They are so strong to carry all of that. It looks pretty heavy. Very neat photo. I gues you are helping the the sheaves. So... it's not "bringing in the sleeves"?? Kidding - I knew it was sheaves, but my sis is classic for always singing the wrong lyrics to songs! Something we don't see in the city! My grandmother always sang that song to me at bedtime. I couldn't remember the words though. I'm off to read the next post!